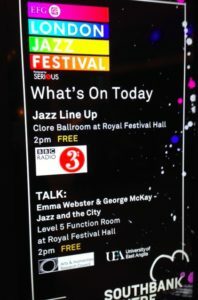 The Impact of Festivals was a 12-month project funded under the AHRC’s Connected Communities Programme, working with research partner organisation the EFG London Jazz Festival. I was the Principal Investigator, and the Research Associate was Dr Emma Webster, co-founder and director of Live Music Exchange. You can read about the project in more detail on its website. Do festivals contribute to local competitiveness, and if so, how? What contribution do festivals make to the local region in terms of a ‘cultural offer’? 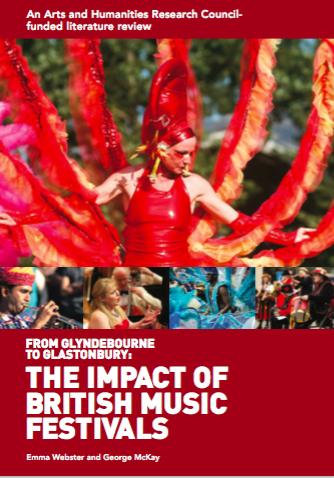 What contribution do festivals make to regional economic growth? What impact do festivals have on: i. the formation of a temporary community (i.e. among festival goers)? and ii. the permanent community which lives at the festival location? How has impact developed over the history of a festival? Drawing on the findings to questions 1-5, what are the processes through which arts and humanities research (including practice-based work) has impacted on festivals? 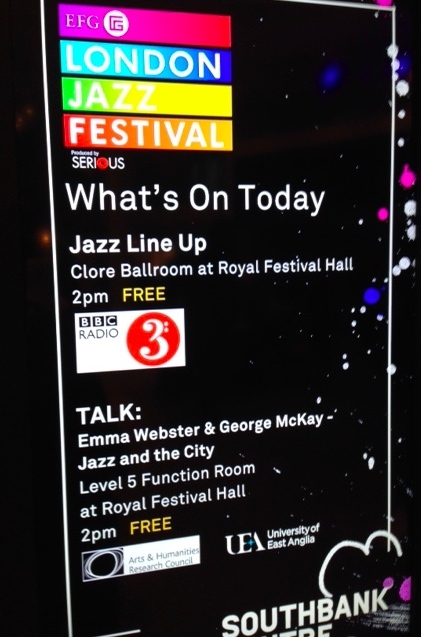 Jazz and the City symposium, Royal Festival Hall, EFG London Jazz Festival, November 2016.